Romana is a Bangladeshi heartthrob model and actress who already won the attention of the audience by her wonderful acting performance. The nice looking actress Romana comes to the timeline around the country when appeared in the movie ‘Bhalobaslei Ghor Bandha Jay Na’. She draws the attention of people within very short time. Now, Romana is a familiar face in the showbiz industry of Bangladesh. Romana was born in Dhaka, Bangladesh. She was so much passionate about media arena from early childhood eventually turned her career into the targeted field. Romana has a brother named Romel who is settled in New York. Romana kicked off the journey in the showbiz industry with modeling; late she turned her career into the film industry. In the movie industry, she was so much successful, although in recent she is away from the film industry. 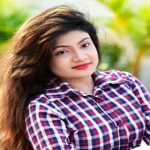 In 2010, she appeared in the movie ‘Bhalobaslei Ghor Bandha Jay Na’ with Shakib Khan and Apu Biswas which was super hit in the Dhallywood box office. The actress won the National Film Award for her outstanding performance in the movie. She acted in the movie ‘Shami Vaggo’ with Dipjol and Amin Khan. Romana has got the huge media attention for her marriage in several times. At first, she married filmmaker Anzam Masud in 2001. After two years together the couple called it over in 2003. Following the year, Romana married Sazzad in 2004. They split their relationship in 2013. For the third time, she married Elin Rahman in 2015 at the house of her brother in New York where her parents were present.